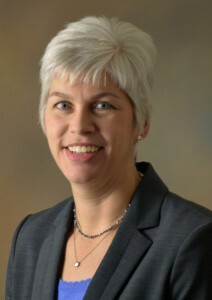 Lisa Johnson - On July 30, 2013, Lisa D. Johnson began serving as Seminole’s fifth Chief Executive Officer and General Manager. As Seminole’s CEO, she is responsible for overall Cooperative operations. She reports directly to Seminole’s Board of Trustees. Prior to joining Seminole, Johnson served as senior vice president and chief operating officer of Old Dominion Electric Cooperative (ODEC) in Glen Allen, Va. Johnson joined ODEC in 2006 following an 11-year tenure with Mirant Corporation and Southern Company. Johnson holds a Bachelor of Science degree in mechanical engineering and materials science from Duke University. She serves as a director on the Florida Reliability Coordinating Council, secretary/treasurer of the Florida Electric Power Coordinating Group, a trustee on the Board of Averett University, a director on the Board of the Florida Electric Cooperatives Association and also serving as a member of the Executive Committee, a director on the Board of the Electric Power Research Institute, and was named one of Virginia’s most “Influential Women” in 2012. Seminole Electric Cooperative is one of the largest generation and transmission cooperatives in the country. Its mission is to provide reliable, competitively priced, wholesale electric power to its nine, not-for-profit, Member-owned distribution electric cooperatives. Approximately 1.4 million people and businesses in parts of 42 Florida counties rely on Seminole Member cooperatives for electricity. Seminole’s primary resources include the Seminole Generating Station (SGS) in northeast Florida and the Richard J. Midulla Generating Station (MGS) in south central Florida. Seminole also owns and maintains more than 350 miles of transmission line. Congress must step in to halt the Environmental Protection Agency’s Clean Power Plan temporarily while the controversial rule to limit carbon dioxide emissions from the power sector goes through the courts, a G&T CEO told lawmakers. Lisa D. Johnson, CEO and general manager of Seminole Electric Cooperative in Tampa, Fla., testified April 14 before the House Subcommittee on Energy and Power in favor of legislation sponsored by Chairman Ed Whitfield, R-Ky., to delay EPA’s rule until courts review it. Whitfield’s bill, The Ratepayer Protection Act, also would states to opt out of EPA regulation if coal plant shutdowns and other compliance requirements adversely affect ratepayers or the electric grid. More than 90 percent of Florida’s coal-based generation would have to close by 2020 to comply with the EPA rule, subjecting co-op members to more expensive electricity sources, Johnson said. Under questioning by the subcommittee, Johnson said a third of the population Seminole serves is below the poverty level. Those lower-income households will be disproportionately hurt by the rule, she said. 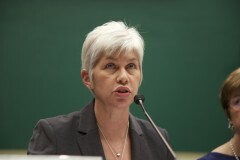 With NRECA CEO Jo Ann Emerson, Johnson also was one of 10 co-op CEOs who met with EPA Administrator Gina McCarthy on April 13 to discuss concerns about the pending rule. Janet McCabe, acting assistant administrator for the EPA Office of Air and Radiation, told the subcommittee that EPA will look “very, very closely” at the many recommendations it has received on addressing grid reliability and costs before it finalizes the rule this summer. Get the latest news from ECT.coop and sign up for your personalized news alerts.